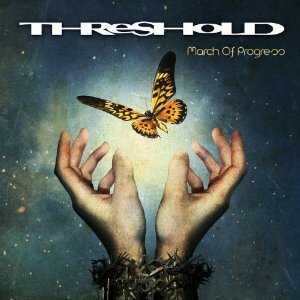 Prog metal band Threshold have released eight albums so far in their long career. Founded in the late 1980's they released their debut album (Wounded land) in 1993. Since then they've built an army of fans around the world with their albums and touring, and are now ready to release their ninth album - "March of progress"
The album will be available in a limited Digipak edition including a bonus track; a standard jewel case edition; as well as a 2-vinyl-edition in two different colours, one of them exclusively available via the Nuclear Blast mail order store. Threshold are a band I've seen play live before, but I've never actually listened to any of their albums. They are great live so I'd got high expectations for their album. Having listened to the album I have to say I'm impressed - it more than lives up to my expectations, and I can see why the band have such a good reputation. With ten tracks, the album clocks in at around 69 minutes, with "The Rubicon" being over ten minutes long - normally that would be an exceptional length song, but with a prog album then its not so unusual to get long tracks. So what can you expect musically? Heavy guitars, good solid drumming and bass, and some nice keyboard work plus some great vocals. The keyboard work is largely quite restrained with it just adding a bit of richness to the music rather than being prominent, although in "The Rubicon" and in parts of some of the other songs, the keyboards are more central to the sound. There's a really good balance between heaviness and the light soaring vocals and that is key to what makes this such a good album in my view. The guitar and drums give much needed power and heaviness and the keyboards and vocals add contrasting lightness and richness to make a really interesting and enjoyable sound overall. This is an excellent Prog album from Threshold - definitely an album that prog lovers should enjoy. "March of progress" will be released on 24th August via Nuclear Blast records.